This two-template set comes in a sturdy black leatherette carrying case. Each template is designed for use with a medium ballpoint pen or conventional pencil. 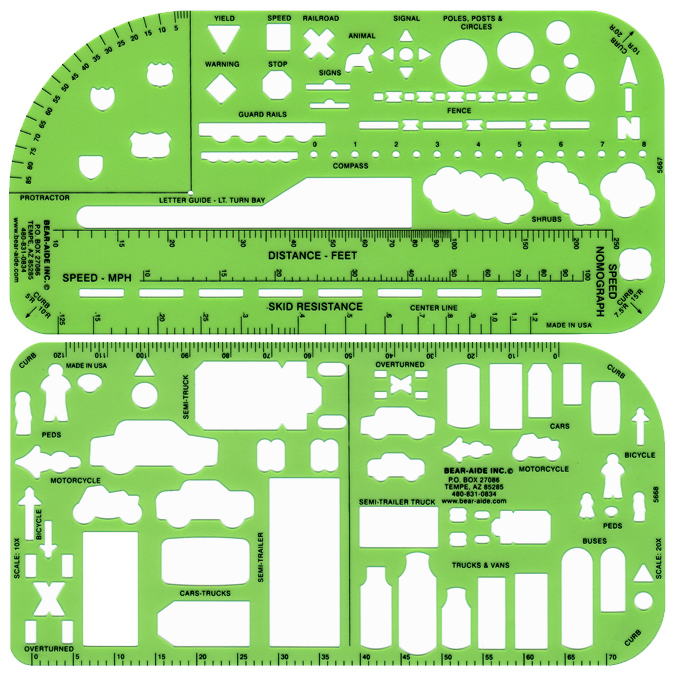 The symbols are conveniently grouped with vehicles and pedestrians on one template and miscellaneous symbols, including a speed nomograph, protractor, compass, etc., on the other. The vehicles and pedestrians are provided in two convenient scales - one inch equals 20 feet and one inch equals 10 feet. Two scale rules are included. Size 4" X 8" each. Price includes shipping & handling. Click on product thumbnail image to view large image.